What do you get when you mix the familiar story of a vengeful ghost, the sad end Marie Antoinette met at the scaffold in October of 1793, and a young American teenager in Paris? 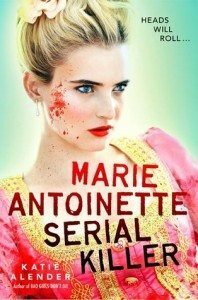 You get Marie Antoinette, Serial Killer, by Katie Alender. Colette Iselin is on a school trip, which includes nine days in Paris, France with her French class and loads of fun with her friends Hannah and Pilar, who are at the top of the high school social ladder. When she arrives in Paris, Colette hears about the mysterious murders of several young members of some of France’s wealthiest families. When she goes to Versailles, though, she sees the ghost of a young woman in eighteenth-century clothing, who leads her to one of the deserted buildings in Marie Antoinette’s hameau. Colette wanders into a room that the dead queen and her children once used, and she feels as though the young woman is trying to tell her something. But there is something more to it: While touring the queen’s bedroom, Colette keeps seeing the figure of the cornflower—Marie Antoinette’s favorite flower—throughout the decor. The cornflower matches the design of the medallion that she found in her family’s storage room. With the help of the tour’s guide, Jules, who is a history student at the university, she discovers that her family was once French royalty, and that they were part of a secret society that was supposed to protect the queen. When the throngs of starving subjects gathered at Versailles on the fateful night of October 5, 1789, the society betrayed the queen and her children in exchange for their own safety. The ghost of Marie Antoinette is targeting the descendants of these families, and it’s up to Colette to figure out what the queen wants before she becomes the next target. While the idea is an original one, the execution is subpar at best. Alender is very careful to point out that her story is fictional, and it’s clear she has done a lot of research. However, it’s very clear that the book has been edited for saleability and to appeal to an audience of young girls who are still besotted with the Bella-like heroine that has become de rigeur. While Colette is a much stronger heroine than Bella Swan and possesses much more agency, the Bella-like qualities of being simply average and “cute, but not beautiful” are emphasized. Alender also tends to play on American notions of the French culture: That they are more fashionably inclined than Americans, as Colette is shown to be, and that while Americans might sit down to a meal together but be distracted or wolf their dinner down, French families tend to sit at the dinner table together and make time for each other. It’s important to remember that despite nationalities and cultural backgrounds, every individual and family is different and that you shouldn’t make assumptions. The most impressive part of this novel is Colette’s conflict between maintaining the facade of being well-off for her status-obsessed friends and the reality that her mother has been left with the brunt of supporting the family after divorce. Colette’s relationships with her friends and classmates closely mimic that between her ancestor and Marie Antoinette; Colette has been able to climb the high school social ladder just as her ancestor Véronique elevated her position at court enough to become an intimate of the queen’s. Colette finds herself having to make the same choices that her ancestor did and finds that with her decisions, she might be able to redeem Véronique with the queen. I would give this novel two out of five unicorns. It’s a good light read with a bit of history in it if that’s what you’re looking for.